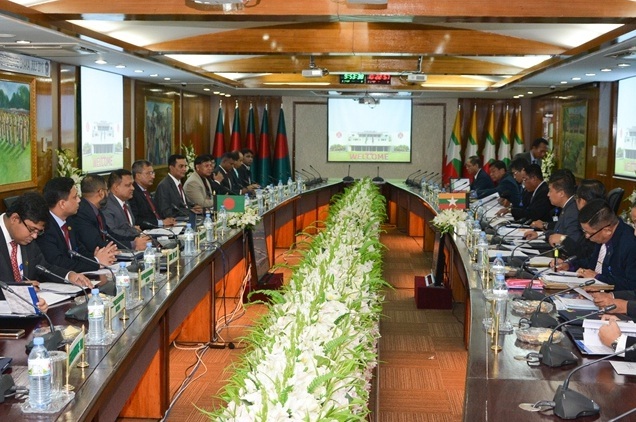 A 4-day border conference between Border Guard Bangladesh (BGB) and Myanmar Border Guard Police (BGP) begins at Pilkhana BGB headquarters here on Monday morning. The senior officials’ level conference between the border forces of the two neighboring countries will be ended through signing of a Joint Record of Discussion (JRD) on Thursday, said Public Relation Officer (PRO) of the BGB headquarters Md Mohsin Reza. BGB Additional Director General Brig Gen Md Anisur Rahman is leading 15-member Bangladesh delegation, while Myanmar side is being led by its Chief of Police General Staff Police Brigadier General Myo Than is leading 11-member delegation in the conference. Border security issues, including prevention of smuggling of illegal drugs, especially, yaba pills, firing at frontiers by BGP and Myanmar Army, trespass into Bangladesh territory by Myanmar nationals, operating Myanmar military helicopter and drone at bordering areas, removing landmine or Improvised Explosive Devices (IEDs) from zero line of border, setting up Border Liaison Office, implementation of development activities in frontiers and steps for increasing mutual cooperation as well as confidence are up for discussion in the agenda of the border talks.